206 results. Displaying results 61 - 80. 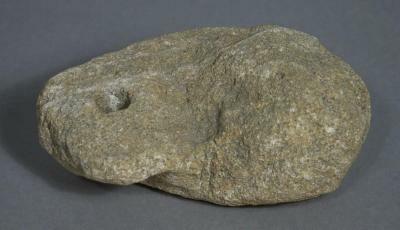 A stone net weight found at Buscot Lock. 'Tis a pity it got away!' 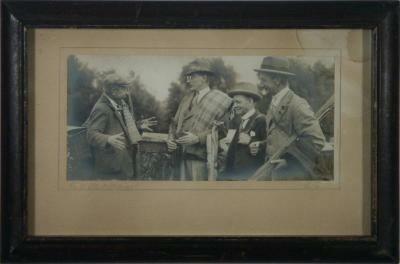 A framed black and white photograph of four anglers, by R J., The people in the photograph are identified as (l to r)Harry Round, W. (Jack) Frewin, Frankie Powell, fourth person unknown. Four men are shown in the photo, standing by a fence holding fishing tackle. The man stood on the left, wearing a scarf and flat cap holds his hands apart to indicate the size of 'the fish that got away'. The other three men listen to him and smile, they are wearing Trilby style hats. Written across the bottom, beneath the photo is "Tis a pity it got away!". A metal fish spear head with two prongs, used to catch fish. Cast iron with two prongs in a curved shape, each with a tanged point on the end. A small turkey quill sliding float used to catch small fish in quiet water, made by Colin Whitehouse in 1998. A sedge reed float used to catch small fish in slow backwater streams, made by Colin Whitehouse in 1998. 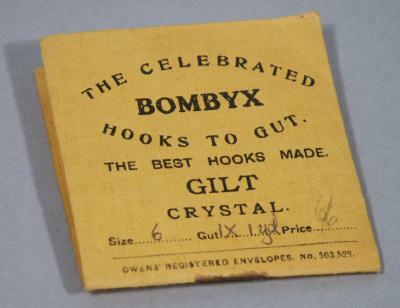 A packet of twelve "Bombyx" size 6 hooks, used in angling. 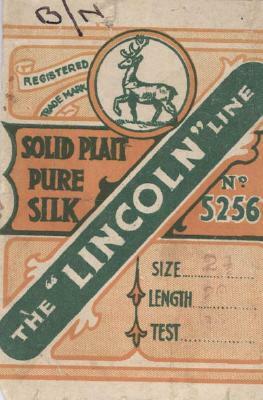 A packet of silk "Solid plait pure silk, The Lincoln Line, size 2½", used in angling. Float used for keeping the hook in view, the colours attracted fish and it alerted the fisherman to when he had a bite.